The College of St Barnabas received an all time record number of visitors during CRE 2013 at Sandown Park. In previous years the College expected to meet some 400 people during the four days of the exhibition. This year they received almost 500 visitors to the stand. 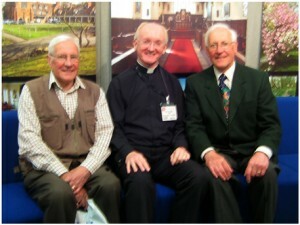 Among those who visited the College stand were authors Adrian Plass and John Cox (seen here with his twin brother Paul) and Larry Bush, who is Chairman of the Giving Committee at Hexham Abbey who regularly support the work of the College, as well as being a fellow exhibitor as a director of Traidcraft. We are pleased to announce the launch of our brand new website on Monday 13th May. The new site retains all the features of our previous website but has a much more contemporary design.